The holidays are a wonderful time, aren't they? 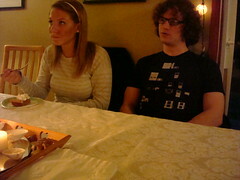 You get to sit around and eat. 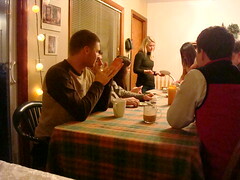 Hopefully at someone else's house, where they cook and you don't have to clean up afterward. But what about the big house? That is to say, the White House? 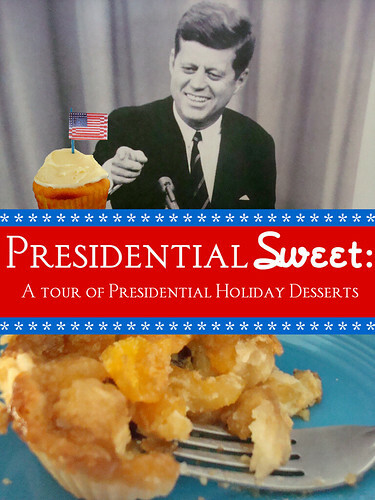 We began to wonder what sweets and traditions might have played into Presidential culture, in both the current age and years past. 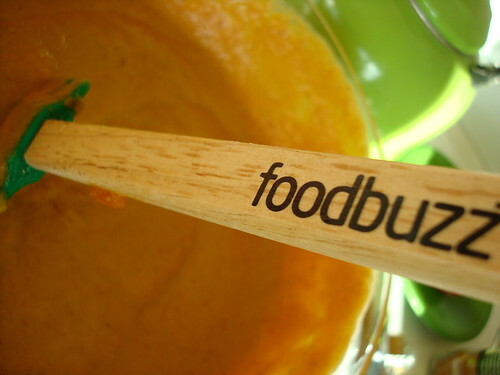 And luckily, we were chosen by Foodbuzz for the 24, 24, 24 project so we suddenly had the time and the means to learn and explore a bit more--all amounting to quite a sweet surprise for our family and friends the entire week of Thanksgiving! 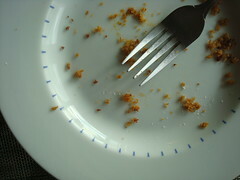 Let's just say it wasn't just one day of feasting chez Cakespy. A note about Thanksgiving: You'll notice that most Thanksgiving recipes kick in later on in the list--this is because although the first one was celebrated in 1671, it wasn't actually a holiday (or even celebrated regularly) until 1863, when Abraham Lincoln finally made it a national holiday. But there was plenty of other holiday goodness going around before--and since! 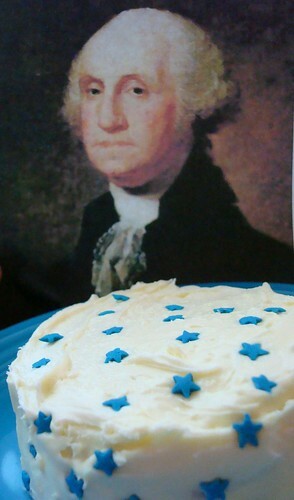 Washington's Great Cake: Our journey of delicious started with the big man, that Cherry-tree killa George Washington (OK, so maybe he did it, maybe not). 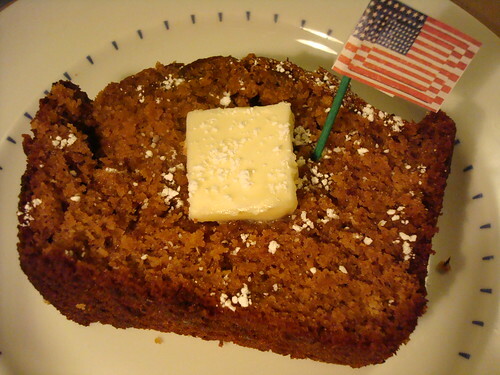 Though George Washginton did have a Thanksgiving dinner, what we found much more entrhralling was Martha's famous "Great Cake" (read more here! 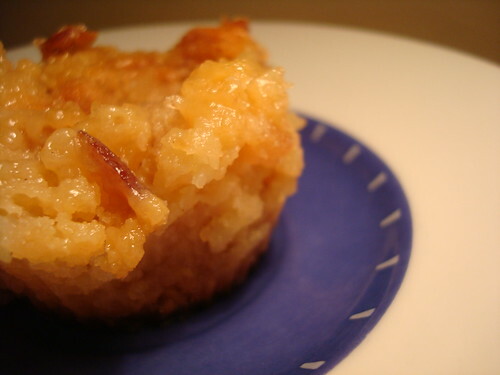 ), one of her favorites which was traditionally served at Christmastime. This cake truly was great--especially in size, as it called for 40 eggs, 4 pounds of butter, and a variety of fruits including 2 pounds of apples, and plenty of cream sherry. While tempted, the materials just seemed like a bit of a wast, so ultimately we did the recipe in 1/8 scale and it actually worked out ok; we ended up swapping egg-white icing (an acquired taste in our opinion) for a rich cream cheese frosting with some festive stars. George would approve, we think. 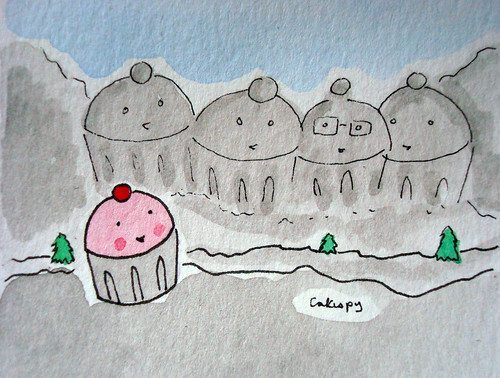 If you want to try the actual recipe for THE great cake though, check out this site. 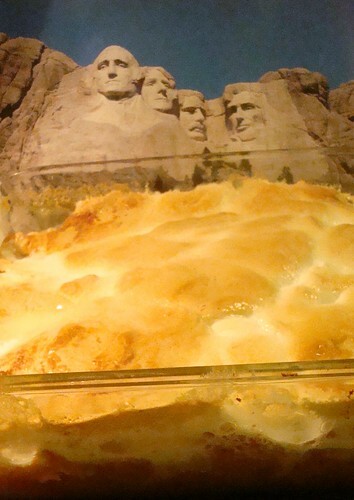 Thomas Jefferson's Corn Pudding: TJ was certainly a renaissance man, and in addition to a great deal of hobbies and interests, he was quite the gourmand--he's even credited with introducing the greater US culture to the île flottante (which he served at a New Year's fete). 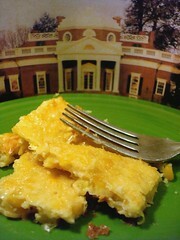 Though Thanksgiving wasn't technically a holiday yet, we like to think that he'd serve something like this sweet corn pudding at his table--a popular recipe during his Presidential years. At our table, we found it to be a pleasant-tasting dish--like some types of cornbread, gently skirting the line between side dish and dessert. Place all ingredients in a blender and mix at high speed 10 seconds. Pour into well greased baking dish and bake 45 minutes at 375 degrees. To make enough for company I triple the corn and double everything else and bake it for an hour or more until a knife comes out clean. 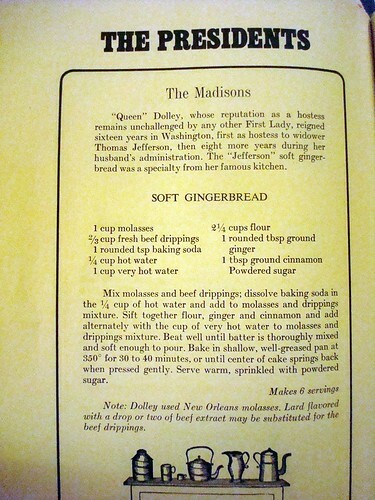 Madison's Gingerbread: While to many, the Madisons (namely, Dolley) are linked to ice cream, Dolley also had a much warmer, but equally delicious, favorite for the holidays--Soft Gingerbread. Apparently hers got its unique and delicious flavor from beef drippings, but call us chicken, we decided to use butter instead and while we have no point of comparison, this one was very moist and delicious, so the butter seemed to have worked just fine. If you'd like, though, be the judge yourself! Mix molasses and beef drippings; dissolve baking soda in the 1/4 cup of hot water and add to molasses and drippings mixture. Sift together flour, ginger and cinnamon and add alternately with the cup of very hot water to molasses and dripping mixture. Beat well until batter is thoroughly mixed and soft enough to pour. Bake in shallow, well-greased pan at 350 degrees for 30 to 40 minutes, or until center of cake springs back when pressed gently. Serve warm, sprinkledwith powdered sugar. Makes 6 servings. Martin Van Buren's Doughnuts: Well, we didn't actually make them, but we were fascinated to learn two facts about MVB: first, he and his wife spoke Dutch at home (he was American-born but of Dutch heritage); the second, that his favorite food was doughnuts. Here's a recipe for an 1800's era Dutch doughnut (oliebollen) that we bet he would have loved on Christmas morning. *Mischievous note* William Henry Harrison Might have Liked it: well, he wasn't president for long. but, he did prompt us to learn more about Funeral Pie. *Mischievous note* James K. Polk might not have had much of an interest in food, but we'd officially like to dedicated the Bûche de Noël and the millefueille to him--after all, he was Napoleon of the Stump. Abraham Lincoln / Mary Todd Lincoln's Vanilla-Almond Cake: It's said that this is the one Mary made when courting Lincoln in the early days. Since they both met and later married during the holiday season--not to mention that Honest Abe declared it to be the best cake he'd ever tasted-- we figure it's a good holiday offering to represent Lincoln's era. While the cake itself is good--dense, slightly nutty, and plenty buttery--we're not so sure about its aphrodisiac powers. 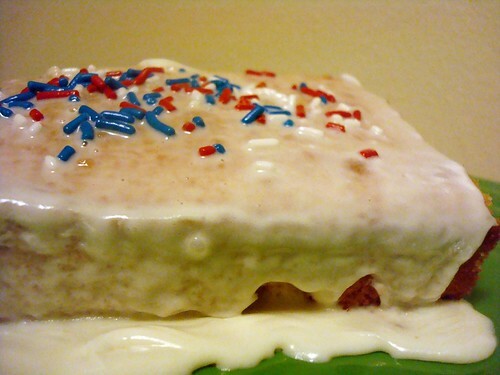 We made our cake in just one layer, not two; all the more frosting to glaze on over it all. Stir together the cake flour and baking powder; add to creamed mixture alternately with milk. Stir in almonds. Bake at 375 degrees F for 28 to 30 minutes. Cool 10 minutes; remove from pans. Fill and frost with White Frosting. 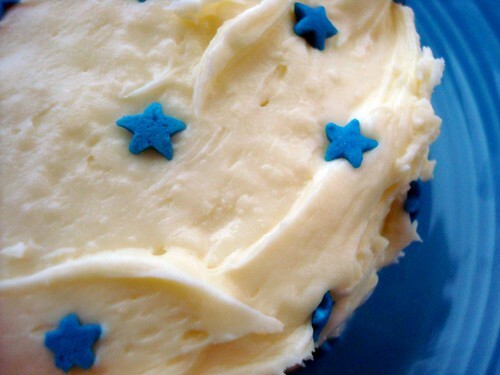 White Frosting: In a saucepan, combine 1 cup sugar, 1/3 cup water, 1/4 teaspoon cream of tartar and dash salt. Bring mixture to boiling, stirring until the sugar dissolves. In mixing bowl place 2 egg whites; very slowly pour the hot sugar syrup over, beating constantly with electric mixer until stiff peaks form, about 7 minutes. Beat in 1 teaspoon vanilla extract. Cakespy Note: Though it's not strictly dessert, we couldn't help but notice that Andrew Jackson, FDR, Calvin Coolidge, and LBJ all had an admitted penchant for pancakes. We'll bet these carb-lovin' presidents would have enjoyed this Christmas tree composed of crepes like this one. William Howart Taft: It takes only a mere glance at the man to tell that he was as serious about sweets as he was about politics (it's true--he weighed well over 300 pounds). 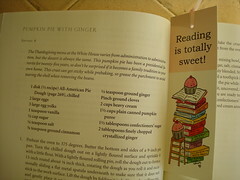 Apparently above all he had a soft spot for pumpkin pie; while we found the recipe below online for a "William Taft Pumpkin Pie", it seems a little bit suspect (we're not sure if they had canned milk then...does that sound ignorant?) we've gotta believe that in a different era, he'd have enjoyed the one at the bottom of this post even better. 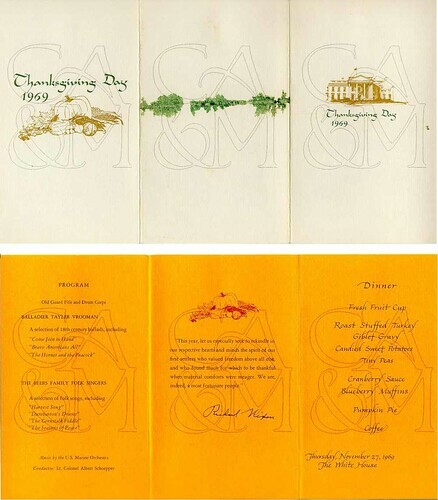 Herbert Hoover, Franklin D. Roosevelt, Richard Nixon (his menu below) and Lyndon B. Johnson were apparently huge fans of the sweet potato casserole; happily, there's an official White House recipe. We doubled the marshmallow for added awesomeness. The founding fathers would approve, we think. We sure dug into this one with relish--er, sweetness. Preheat oven to 350 degrees. In a large bowl, lightly mix all the ingredients except the marshmallows. Spray a 9 inch casserole dish with cooking spray. Pour the custard and top with a half bag of mini marshmallows. Bake for about a half hour. Keep warm for service. WHITE HOUSE MENU GUARDS WAISTLINE. The White House announced today an ample menu for the Thanksgiving dinner which President Truman will sandwich in between two diplomatic dinners, but he’s still dieting. Mrs. Sharpe gave the Thanksgiving menu as follows: clear bouillon, curled celery and olives, roast stuffed turkey, cranberry sauce, giblet gravy, candied sweet potatoes, buttered peas, cauliflower au gratin, orange and cress salad, pumpkin pie with whipped cream and cheese, candied fruit, nuts, coffee. 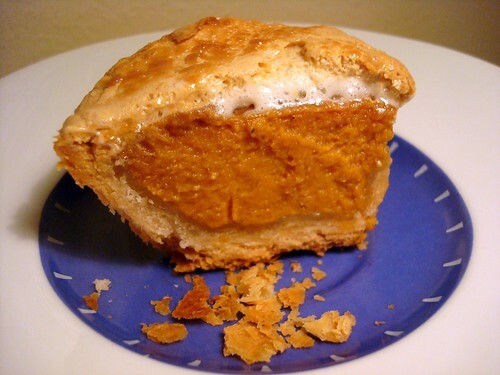 And so, we figured that it would be in keeping to make a pint-sized (diet friendly) pie for Harry--so, with an extra bit of filling from the Mesnier recipe (bottom) we made a single-serve piece in a cupcake cup, with a low-fat marshmallow topping. Still yummy, and mos' def cute! Kennedy's Hot Fruit Dessert Pies: It's known that assorted pies and ice cream always played a role in the Kennedy Thanksgiving dinner. 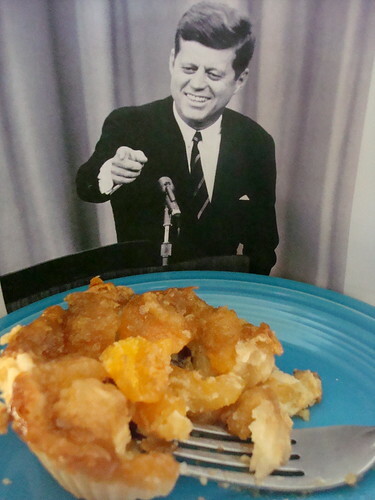 However, we took it a step further by combining the pie idea with Jackie Kennedy's famous Hot Fruit Dessert (click here for the recipe)--her signature dish. 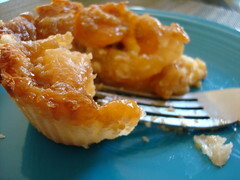 We made the dessert but then baked it in as a pie filling; we used extra pie crust from the recipe at the bottom of this post and used it to line cupcake cups, filling them with the fruit slurry and topping it all off with a brown sugar glaze on top. Though we're not usually fruit pie fans, this one had enough of a rich kick from the buttery glaze and sour cream that even we were impressed. As seen below, we think JFK approves as well. Of course if you don't care for fruit pies, you could always try to replicate these cookies. 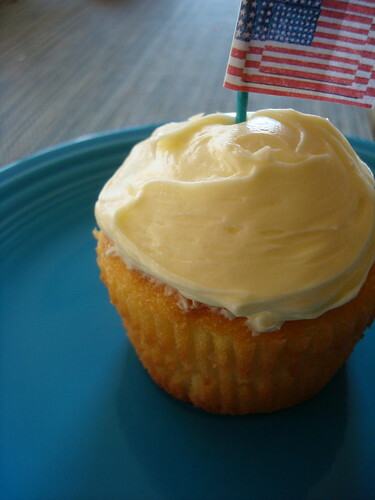 Johnson's Lemon Cake: Behind every great President is a great First Lady, and behind at least one first lady--Ladybird Johnson--was a great arsenal of awesome cake recipes. 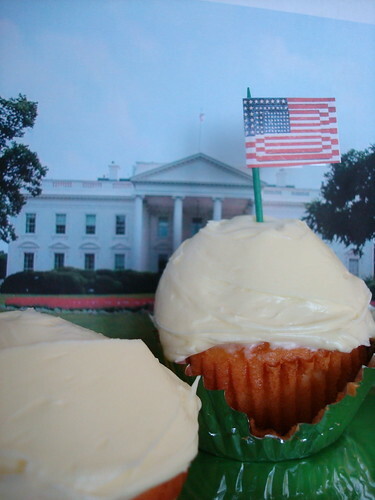 We went for one of her (and the President's) favorites--taking a modern twist and making them into cupcakes. The result? A cupcake that is light, fluffy, and simply delicious--so refreshing, it provides a nice foil to all of those other holiday foods! Cream butter and sugar until fluffy. 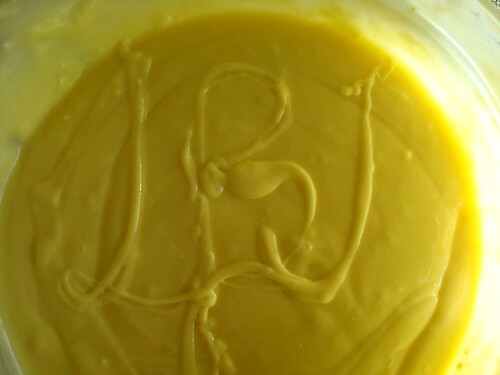 In a separate bowl, beat egg yolks until light and lemon-colored; blend into creamed mixture. Sift together flour, baking powder and salt; resift 3 times. Add sifted ingredients to creamed mixture in thirds, alternating with milk. Beat the batter thoroughly after each addition. Add vanilla extract, lemon rind and lemon juice; beat 2 minutes. Bake in greased 10-inch Bundt pan in preheated oven at 325 degrees F for 1 hour or until cake tester inserted in center comes out clean. You can also can use three 9-inch round cake pans and bake at 350 degrees F for 25 minutes. Double the frosting recipe for a layer cake. Combine ingredients and beat, adding cream until desired consistency. Jimmy Carter's Pecan Toffee Tassies: Now, Jimmy Carter did have holiday meals at the White House, duh, but even more importantly, he was the first Presidential figure to ever bake with Paula Deen--so we'd say that these cookies are a step above. We'd serve these at any Christmas party. 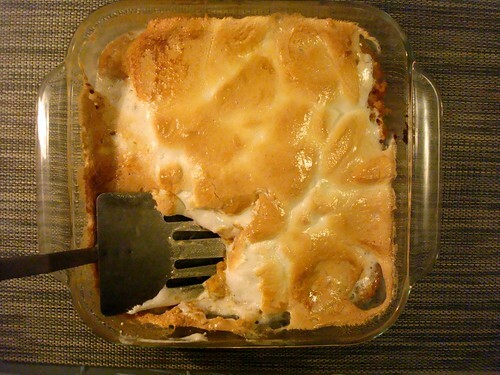 Ours were stickier and less pretty than Paula's, but man, were they rich and delicious. Needless to say, they disappeared really fast. every year, the holiday season was kicked off with the "running of the 'nog", our playful way of referring to the tour of the House we made with the eggnog (and a riff on the "running of the bulls" from Pamplona, Spain). Put the yolks and sugar in the bowl of a standing mixer fitted with whisk attachmen; whip until pale yellow ribbons form, 5-7 minutes. Add the cognac, bourbon, and rum, whip well, scrape down the sides, and mix again. Transfer the mixture to a 6-qt bowl. In separate, clean mixer bowl, whip the egg whites and salt until very stiff peaks form. Fold into eggnog mixture. Wipe out the mixer bowl, pour in the cream and vanilla, and whip until very stiff peaks form. Fold this into the eggnog mixture. Add the milk and whisk until smooth, 3-5 minutes. Chill, garnish with nutmeg (and cinnamon, in our case!) and enjoy! 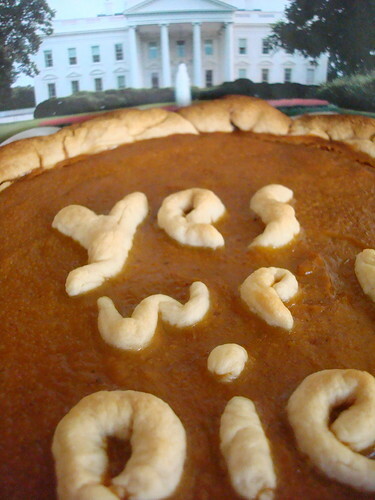 And for the past 25 years or so, apparently one pie has risen above all others in the White House: Raymond Mesnier's Ginger Pumpkin Pie. So we made it--here's one thing we wouldn't mind passing on to the next administration, we must say. Makes enough for 2 12-inch pie shells. 1. Heat oven to 375 degrees. Place ingredients in mixing bowl. Then using paddle attachment of an electric mixer, mix until well blended, about 3 minutes. 4. Prick crust with fork on bottom and sides. Crumple a piece of parchment paper; open up and grease one side of the paper. 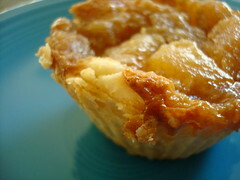 Place greased side down in crust; fill bottom and a little up the sides with dried beans. 5. Bake 15 minutes; remove from oven, and carefully remove paper and beans. 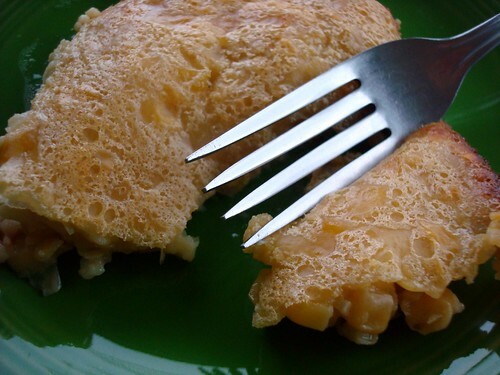 If crust tears, patch it by pressing together with your fingers. Bake another 10 minutes, until crust is brown, and remove. 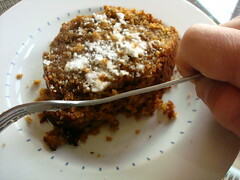 It is not necessary to wait for crust to cool before filling. 2. Beat whole eggs and yolks lightly. 3. 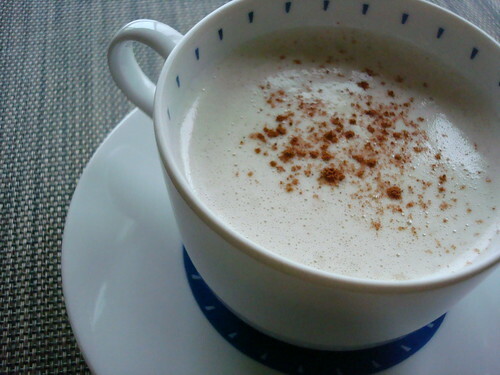 Cream sugar and eggs, and beat in salt, cinnamon, ginger, cloves and milk until thoroughly blended. Stir in the pumpkin. Pour into pre-baked pie shell. 4. Bake about 1 hour, until a toothpick inserted in center comes out clean. Do not jiggle. Cool pie on wire rack, then chill. 5. 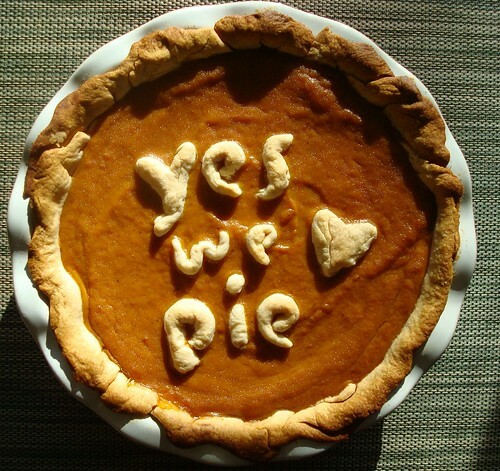 To serve, whip cream and pipe around edge of pie; decorate with candied ginger. As for a grand finale? How about a sculpture of Mt. 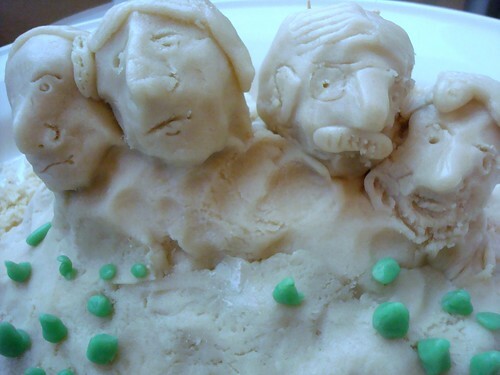 Rushmore rendered in sugar cookie dough and cake? OK, it sounded great in theory--but alas, our chef d'oeuvre turned out to be a major chef don't. And yet...while eating hunks sugar cookie dough molded into a vague visage of a President, one can't help but be slightly dazzled by all that sweetness--regardless of whether the outcome looked more like an unholy mashed potatoes and peas combination. Hey, you win some, you lose some. In closing? Have a sweet Holiday Season, and thank you again to Foodbuzz for letting us have fun with the 24, 24, 24 project--and do check out the other entries here! The White House Cook Book : A Comprehensive Cyclopedia of Information for the Home Containing cooking, Toilet and Household Recipes, Menus, Dinner Giving Table, Etiquette, Care of the sick, Health Suggestions, Facts Worth Knowing Etc.